There was a rare moment of humour moments before a used car dealer was jailed as his phone started to play The Great Escape. Neil Gaffney was in the dock for sentencing having been found guilty of selling a dodgy car when his phone began to ring, with his apt choice of ringtone causing a ripple of laughter in the court room. 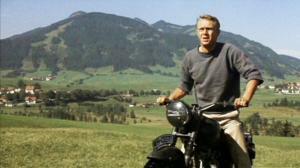 The soundtrack to the hit film The Great Escape sounded out at Birmingham Crown Court, which may prompt his jailers to keep an extra close eye on their new inmate. This comical moment aside, a car dealer being convicted of dodgy dealings is an extremely serious issue. Not only can it land the individual in jail, but it will also make it far more difficult for them to obtain a road risks insurance or motor trade insurance quote in the future, with insurers reluctant to offer policies to car dealers with a criminal record. Mr Gaffney, 48, was on his way from the dock when the tune started to play, with the Birmingham Mail reporting: "It remains unclear whether this was a deliberate act on the part of the defendant, or just an unhappy coincidence." The car dealer was convicted after it was discovered that he had conned a family into buying a Nissan Terrano for £1,400, which he claimed drove as almost new. In reality the car was badly corroded, making it potentially dangerous to drive.